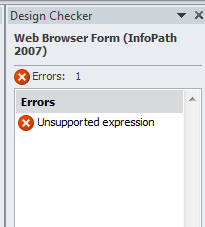 Unsupported Expression in InfoPath 2010 | Are you a user? 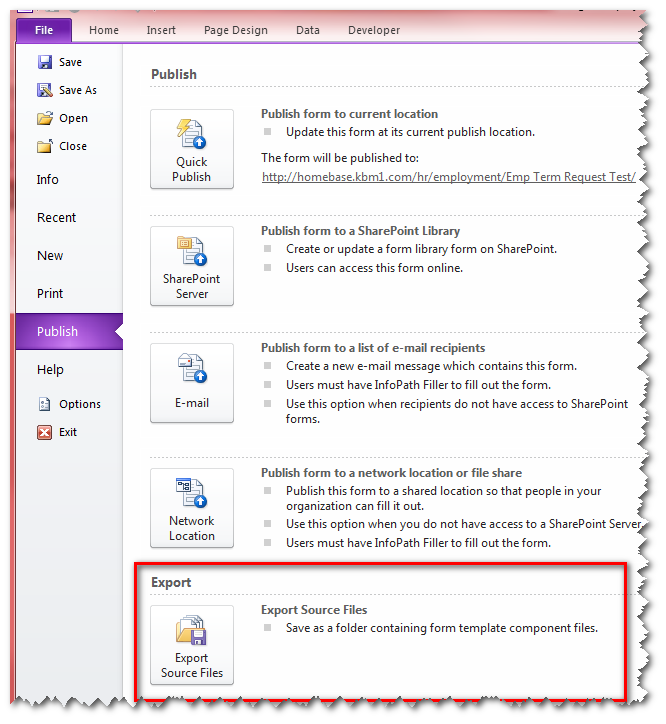 Going back to a SharePoint 2007 site formerly published with InfoPath 2007. Downloaded the form template and made some changes. When I went to re-publish I encountered an “unsupported expression” error. The actual long message was as follows. This appeared to have been coming from one of the people pickers (circa 2007 variety) but copying the Xpath on each of them yielded no easily identifiable pc:DisplayName. I went back to the original template with no changes and it didn’t throw the same error during publishing. I changed the Form type from Web Browser Form (InfoPath 2007) to InfoPath 2007 Filler Form and attempted publishing. The error went away. So, I changed it back to Web Browser Form (InfoPath 2007) again…the way it originally was. The error stayed away and I published the form. I saved the XSN as source files and looked within all the files. I was able to find where the pc: schema infiltrated my form template. Within view1.xsl I found the offending pc:DisplayName, and all the other related pc: references. I’m not sure how this made its way into the form template, as I never specifically made this change, nor do I know how one would force this. I did a simple “find and replace” on all the pc: occurrences with my: and saved and tested my work. All appears to be okay. Sure would be nice to know how this happens!